The last time the Wild ventured west for a road trip, the team took off – winning five out of seven away from Xcel Energy Center. 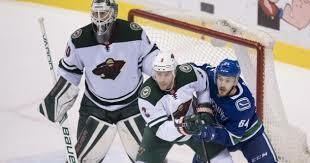 And the Wild will try to rediscover that recipe for success Tuesday to nix a three-game slide when it visits the Canucks in Vancouver for the start of a three-game tour of Canada. A stop in Vancouver started that five-in-seven run, one of just two losses in that span. The Canucks upended the Wild 5-2, and the team is expecting the encore to be just as challenging. While that trip was a fruitful one for the Wild, the road hasn’t been as successful of a backdrop of late. Since that 5-2 showing, the Wild has dropped two straight as the visitor. But when the team left the Twin Cities for an extended period, it found a groove that keyed one of its most productive stretch of the season. 6-6: The Wild’s record on the road this season. 12: Points on the road for wingers Mikael Granlund and Zach Parise. 4: Goals for center Eric Staal in his last five games. 9: Losses for Vancouver in its past 11 games. 6: Home wins for the Canucks this season. After a steady start, the Canucks have slid down the standings to sit 11-15-3. They’re coming off a 2-1 loss to the Dallas Stars Saturday, the team’s third straight defeat. Rookie Elias Pettersson, however has been a bright spot for the organization. He leads all rookies in goals (13), points (22), power-play points (8) and shooting percentage for a minimum of 10 games played (26.5). Center Bo Horvat ranks second in the NHL in faceoff wins (404).